You can get a two-pack of Wemo dimmer switches for barely more than you'd spend on just one at Amazon right now. Add some smarts to your home lighting system today with Amazon deals on a few essential lighting items. First is a two-pack of Wemo dimmer switches; usually $80 apiece, you can get the pair for $100. Also on sale: Philips Hue White and Color Ambiance A19 bulbs for $40 each, down from $50. The Wemo dimmer switches give you control over your lights from anywhere, hub-free. Compatible with Alexa and Google Assistant, you’ll be able to use your voice to adjust lighting conditions. You can also create schedules, dim lights, and set Night Mode to keep lights low as it gets dark. For even smoother integration into your smart home system, these switches are compatible with Nest and IFTTT, and they’re able to adjust to any bulbs you use to create an optimum dimming range for your specific bulbs. We gave the Wemo dimmer switch 4 stars out of 5 in our review, pointing to the user-friendly app, easy installation, and compatibility with other systems as reasons to buy. The Philips Hue White and Color Ambiance A19 bulb is a smart LED bulb that offers over 16 million different colors of light. 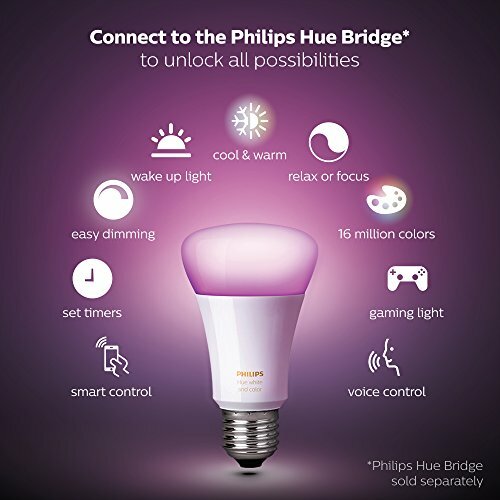 Once you’ve connected to the separate Philips Hue bridge, you’ll be able to control the bulb using other smart devices or your mobile device, or connect to Amazon Alexa, Apple Homekit, or Google Assistant for voice control. This bulb averages 4.2 stars out of 5 on Amazon over nearly 450 reviews, with users noting the bulb is worth its price even before this discount. This story, "Smarten up your home lighting for cheap with deals on Wemo dimmer switches and Philips Hue bulbs" was originally published by TechHive.